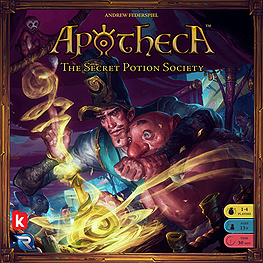 Across the land, an invitation has summoned the most clever apprentices: a chance to enter the secret potion society. The cutthroat members, the Apothecaries, have grown too savvy of each other's schemes. They've chosen you to compete in their black market game! Conjuring powerful magic and deception, outwit your adversaries, and you too might join Apotheca. Devise your plans by hiding ingredients in the marketplace. Reveal secrets to collect precious gems. Recruit powerful apothecaries to do your bidding. The first apprentice to make three potions becomes a member of the secret potion society.